Luang Por Parn is arguably the number one Master Gaeji Ajarn of all Living Memory when it comes to Wicha Khiaw Suea. Many Masters hold a high status for carved Khiaw Suea, but nobody in living memory has attained the same status as Luang Por Parn, except his famous apprentice, Luang Por Nok, of Wat Sangkasi. Luang Por Parn was one of the Great Master Guru Monks of his Era (2368 - 2543 BE), and the originator of the Wicha for Tiger Amulet empowerment of this Lineage, using the Wicha of Wat Bang Hia. Wat Bang Hia is of course a World famous Historical Temple of Monumental Status in the Amulet Scene for the fact that this was the temple of Luang Por Parn, Master Wicha holder of making famous Tiger Tooth and Carved Tiger amulets, whose amulets are now of the 'Maha Sethee' Millionaire master Class. 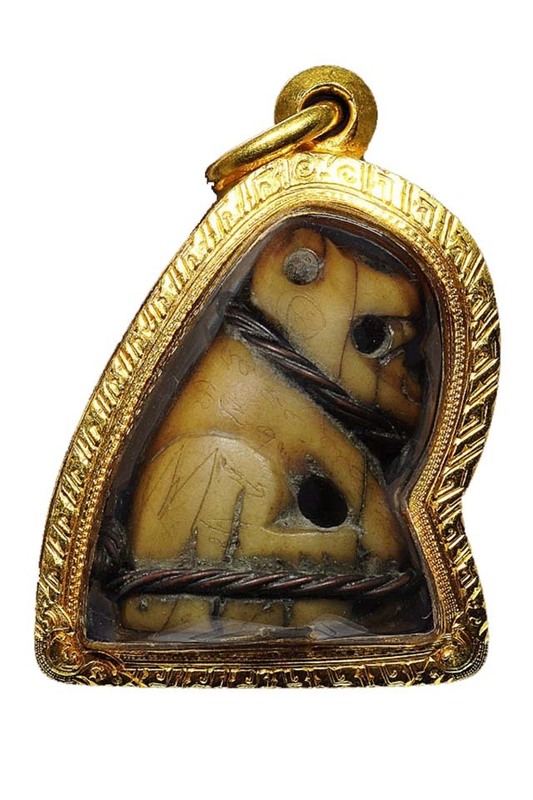 If there is one tiger tooth amulet that stands out above all other carved tiger tooth, bone and ivory tiger amulets, it is the Suea Luang Por Parn Wat Bang Hia. It is the Jewel in the Crown of all Tiger amulets in the High End Collector Category of Pra Pim Niyom and Krueang Rang Niyom. It was the Great Luang Por Parn who was the Mentor and Teacher in Wicha to Luang Por Nok of Wat Sangkasi, who is a Classic Olden Days Master of Legendary Status in his own right, and whose Tiger Teeth Talismans also carry immense Serm Baramee and Maha Amnaj Power. Luang Por Nok practiced the Mastery of Wicha Saiyasart Buddha Sastra Occult magic under Luang Por Parn himself. He fast became Luang Por's most elite apprentice for his fast wittedness, ease of learning and good memory. The inimitable signature markings of Luang Por Parn are evident in Khom Agkhara 'U' letter markings scratched into the surface of the amulet, and around the hollow hole of the base, where the tiger tooth was cut into two pieces for small sitting tiger carvings. 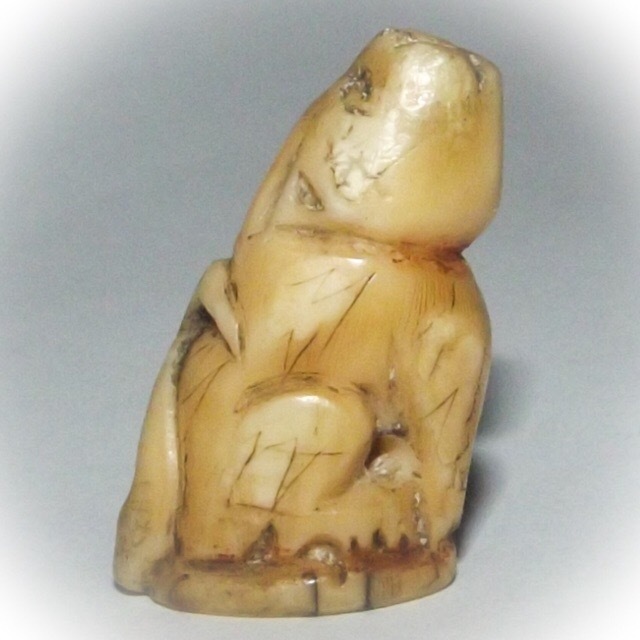 Some of Luang Por Parn's tiger amulets were whole teeth with the incisor attached, and others were cut into 2 or 3 pieces, and carved into smaller tiger amulets like this one, which in the raised 'Suea Ho' 'growling at the moon' head position, is one of the rarest styles to be found from Luang Por Parn of Wat Bang Hia. The 'Kraap" stains embedded into the groove and scratched markings on the surface, reveal the correct Aging features to enter the Era of Luang Por Parn's Time, authenticating this amulet to the highest degree. In truth, an amulet of this calibre, when viewed in a magazine or collector's auction, would rewuire a price tag 5 times the price we are asking. Our Proprietor Ajarn Spencer,does not purchase amulets at such unaffordable prices, rather waits for the right opportunities, to obtain such Millionaire Class Amulets ate a much more affordable rate, Hence, we are able to offer such a top class Millionaire Status amulet a tiny fraction of the officially accepted auction price. Because of this he recieved the teachings and attained Mastery of the methods of Luang Por Parn in a very short space of time, and was soon considered to have a level of Mastery and Understanding that Thai people call 'Dtaek Chan', which means to Master a subject to the poin where one excels above all other practitioners. 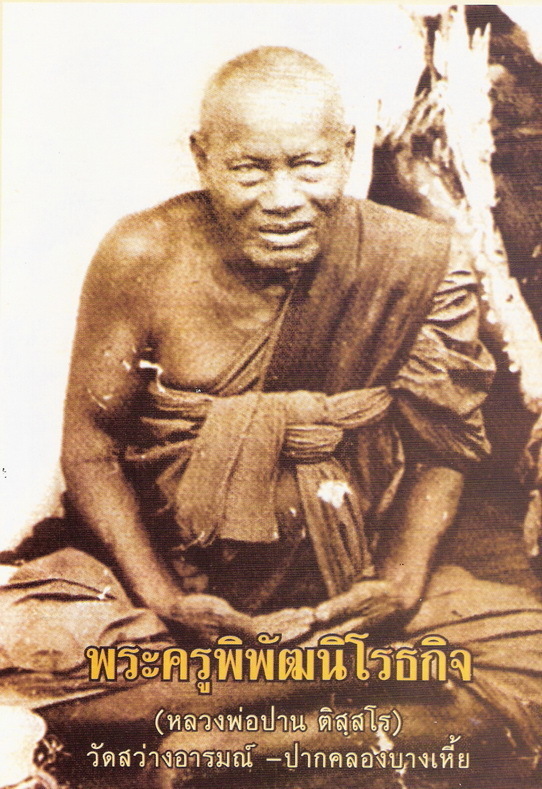 Luang Por Nok often followed Luang Por Parn out into the forest when he would wander on Tudong Practice. This is where Luang Por Parn revealed and taught the Master Wicha of the 'Khiaw Suea' Tiger tooth amulet. The Wicha of Luang Por Nok became so powerful, because he was receiving Wicha from perhaps the greatest Master in Living Memory for Tiger Tooth Talismans. One can say that Khiaw Suea from Luang Por Parn and from his Apprentice, the Great Luang Por Nok, can be considered the top preferred Masters for this kind of Talismanic Charm. They are both immensely rare, and most often completely beyond affordable. Luckily we are patient and vigilant, and try our best to seek both beautiful, sacred and authentic example that are also affordable. It can not happen very often, for good things are hard to find, and far and few between. The Powers of the Tiger Tooth are reputably said to possess Kong Grapan Chadtri, Klaew Klaad, and Maha Amnaj (commanding power and influence), as well as powerful Maha Sanaeh attraction power and Metta Mahaniyom Mercy Charm. The tiger tooth has a hole drilled, for attaching to a cord around your waist, or for other methods of attaching as a pendant. Alternatively, you can take the option of free waterproof casing. Below is a picture of a prize winning example of the Khiaw Suea Luang Por Parn, for comparison and review. The Agkhara inscriptions of Luang Por Parn are based in the Khom Agkhara 'U', and the Unalome Ziga-Zag Spiral. But his inscriptions vary around the surface, and sometimes look like the Thai Numbers 3 and 7 (both of which are Zig-Zag lines). Below a closed mouth example of a famous model by Luang Por Parn, for review and comparison. Notice the zig-zag inscriptions. Notice the aging signs of the discolorations of different areas of the external surface of the amulet. Recommended Uses:Kong Grapan Chadtri, Maha Amnaj (commanding power and influence), Klaew Klaad, Maha Sanaeh, Serm Yos, Metta Mahaniyom. 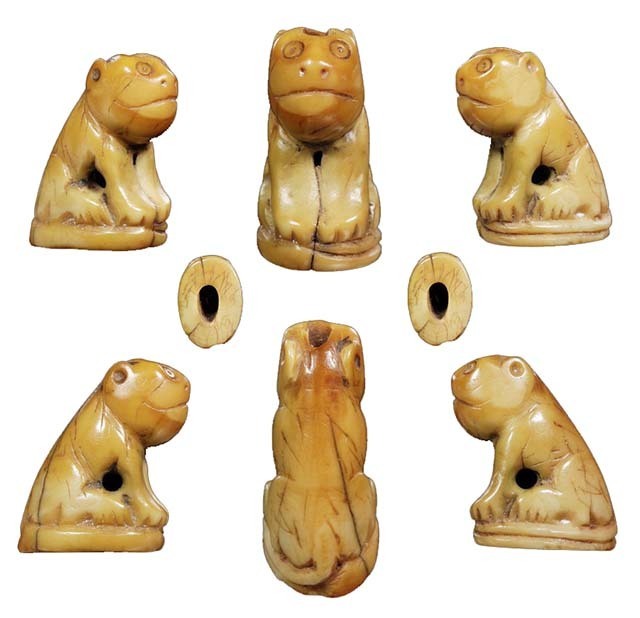 Number of Amulets Made:Luang Por Parn made each of his tiger teeth amulets as single items, empowered by his own hand.